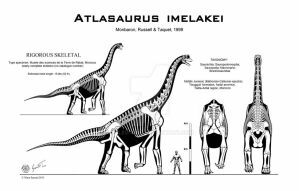 Edit: A massive overhaul of this skeletal (although the bones themselves were fine, it was the last to see the changes from my work on sauropod anatomy). It's still a fugly-looking sauropod, but now at least it looks less...defective. Structural engineers have examined these fossils, and have concluded that these animals could not have existed in the gravity of our modern world, and that the Earth's gravity, in the past, was less than it is today. Please go on YouTube, and look at at videos from the "Electric Universe" and "Thunderbolts Project". There's one in particular dealing with "Dinosaurs pose a problem" for modern gravitational theory. I'm sorry, but that's 100% ridiculous. 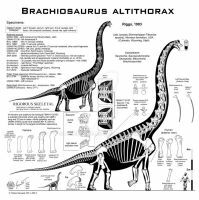 First off, biomechanical studies have found no issues to sauropods existing in 1g - there are dozens of papers on this. None of the so-called structural engineers have every published any professional papers on this (and probably couldn't, because they are making terrible assumptions). Second, there is simply no way that gravity could have been different in the past - gravity is an intrinsic property of mass, and the Earth has not been appreciably growing in mass for the last several billion years. I think you might have the neck and dorsal series a little too big/long, measuring them with a GIMP script they turn out ~5%-10% bigger than the measurements reported by Wu et al. (2013) and Christian et al. (2013). Likely my scale bar is off instead, but I'll take a look as soon as I can. 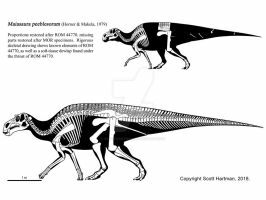 Up to where I knew, Mamenchisaurus' necks were as long as the length of their bodies plus their tails together and up to 18 m. long. This skeletal defies my assumptions. And another issue: How low could this animal get its head? And, in this position, what shape did the neck acquire, an arch o a straight line? Like most animals I expect it could drink (i.e. get its head down to the ground level), and I would expect it to achieve a graceful arch to the neck in doing so...although giraffes don't look terribly graceful, so maybe it would have looked silly (in fairness to Mamenchisaurus, it has a LOT more neck vertebrae to bend with than a giraffe does). I see... guess they weren't able to get the water they needed only from their food. Or perhaps they had to lie down to do things like drinking or mating. Exposing thus themselves to their foes. how on EARTH did this thing move?! Go home evolution. You're drunk. your skeletals are a real eye-candy! truly beautiful! Thanks, although this particular skeletal strikes me as more weird-looking than beautiful. 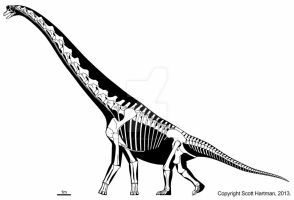 it sure was a weird animal, but what sauropod wasn't weird by today's animal standards? 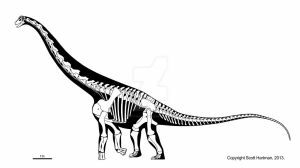 While it, indeed, looks weird as an animal, this is probably what most mainstream media associate with the word "Sauropod". Tiny head on a long neck, long tail and small, chunky body Although the base of the tail gives an impression as if the animal was about to drop a load at any given moment. This is nice for true "Giraffe of the Jurassic." This is yet another moment when the only correct response is, "wtf, nature?" Looks more like some handheld vacuum cleaner than a workable animal! Ain't that the truth . Yeah, it doesn't look real. And yet it's based on a very nicely preserved specimen. Looks like a snake that swallowed a tiny elephant. You're going to have to relay that to one of the paleontologists. They have found a couple, and the others don't look like this. I'm not altogether sure that "M." youngi should actually be Mamenchisaurus. Mind if I use this today as a reference for discussing illustrations? Copyright and site all ready to go on there for it. 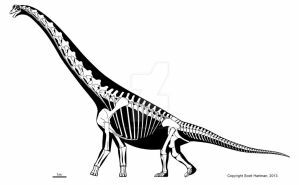 Wow, i love Mamenchisaurus, it's great! Interesting updates. The one of the biggest difference seems to be the orientation of the shoulder blade. 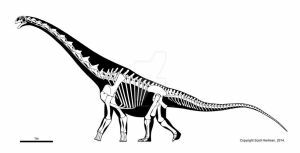 One thing I have noticed is that you (and others) put the shoulder blades of Diplodocids further onto the ribs than you do in other sauropod groups. In Diplodocids you show the coracoid lining up approximatly with the ribs. What is the reason for this? Is it to do with the width of the ribcage? Sort of, yes. 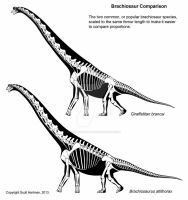 Diplodocids are more slab-sided than other sauropods, and as a result the pectoral girdle sits a bit tighter on the rib cage. There are some other markers on the scapulae that often help line up where they sit on the rib cage, but that's a WFTP sort of thing I'm afraid. 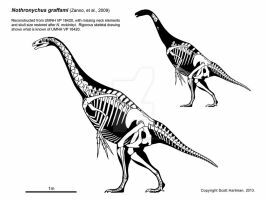 I will say that I had absolutely no idea what I was doing when it came to orienting pectoral girdles before I got to mount a bunch of dinosaurs. Sometimes I got it right anyways, but in retrospect that was luck rather than skill. 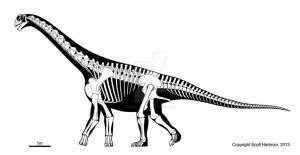 One final aside...I'm a bit more wishy-washy on the orientation (but not general position) of diplodocid pectoral girdles than I am with other sauropods. Part of it is the distribution of articulate specimens amongst taxa, and part of it is seemingly conflicting soft-tissue signals. In the case of mamenchisaurs however, there are actually adaptations in the shoulder joint to allow the arm to retain its normal range of motion even though the shoulder blade is more upright. I wish I had seen this a few weeks ago. 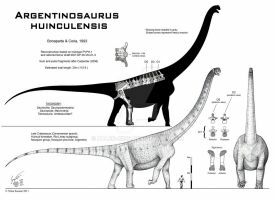 I just resently updated my Mamenchisaurus restoration. 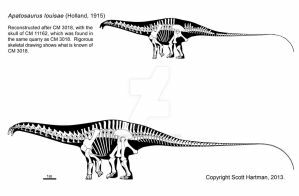 You recently hinted that you were working sauropod neck muscles.. What's your thoughts on how heavily muscled sauropod necks should be? Not massively muscled, but nuchal ligaments on top are not uncommon (probably the rule rather than the exception). Since that top part of the neck is fairly thin side to side, the base of the neck is roughly a square with a triangle on top in cross-section. 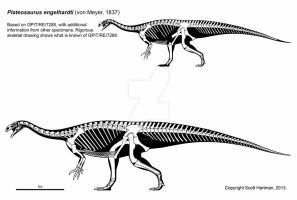 It appears that Mamenchisaurus actually had rather weekly developed nuchal ligaments compared to most sauropods with upright(ish) necks. A crazy long neck if there ever was one. You could slide down that thing! Jeez, look at those vertebrae! MASSIVE! I wish I knew how to draw vertebral columns like that. Yours are so smooth and continuous and pretty. I recommend doing it several dozen times. At least that's how I learned to do it. Do you happen to have a top view of the mamenchisaurus skeleton? Alas, I do not. And at this point it will likely not be until late Fall before I could make one. Sorry! 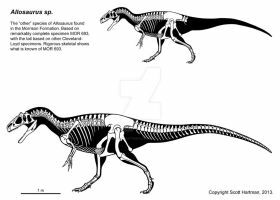 Hello mr Shartman¡¡ i would like to know if could get permission to make a illustration based on this skeletal reference (future illustration).